Some experts point to a toxic cocktail of factors, headlined by the effects of global climate change, which they say is fueling a vicious cycle in the Golden State. To what extent it’s attributable to climate change will continue to be debated, but it’s becoming harder to argue that wildfires—and all disasters—are growing in both scale and severity. In a sector that tends to downplay competition and point instead to partnerships, more nonprofits are facing the reality of a disaster relief industry that’s grown increasingly crowded. Over the past five years, the industry has grown an average of 3.3 percent annually, and over the next five years revenue is projected to continue its growth, albeit at a slower pace, according to research from IBISWorld. Major Rio Ray, Santa Rosa Corps Officer, helped coordinate the response to the October 2017 fires in Santa Rosa as well as the more recent Carr Fire. He’s noticed the change firsthand. But it’s not just charities entering the market. Some credit FEMA’s “Whole Community” approach as the advent of a major shift. The program surfaced in 2011 with a goal of building stronger social infrastructure by tapping the full capacity of every sector. In other words, if it wasn’t already, disaster relief was now everybody’s business: nonprofits, mom-and-pops, corporations, disability organizations, the general public and government partners at every level. And gradually, the landscape of what was, for many years, a low-budget patchwork community effort, began to change. 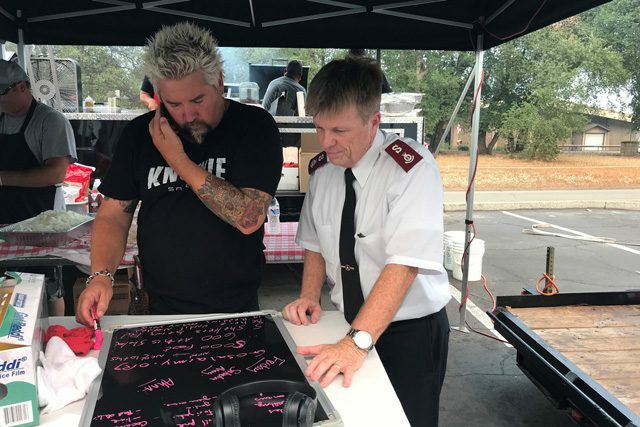 Del Oro Divisional Commander Major Ivan Wild works with celebrity chef and restaurateur Guy Fieri to develop a plan for the Carr Fire feeding operation in Northern California. Perhaps the best known example of the transition is the emergence of World Central Kitchen (WCK), which was recently named one of Fast Company’s “Most Innovative Companies of 2018” in the food sector. Formed by restaurateur and chef José Andrés, WCK entered the scene in 2010 after the Haiti earthquake, and has steadily built a network of world-renowned chefs to be matched with communities in need around the world. Since the Haiti earthquake, WCK has deployed teams to serve in the wake of numerous large-scale disasters, including Hurricane Harvey, Hurricane Maria and, most recently, at the Mendocino Complex Fire in Northern California. The very reason groups such as WKC are being called upon more and more, even if they come at a higher price tag, is because they offer a first-class professionalized service that doubles as humanitarian aid. Of course, that doesn’t mean every organization involved in disaster relief has to develop its own network of culinary powerhouses to compete with the likes of Tom Colicchio. But it does suggest that it’s becoming more difficult for disaster relief organizations to rely on their incumbency, and more crucial to form strategic partnerships, like the one the Del Oro Division formed with Guy Fieri. That, according to Berglund, underscores the need for The Salvation Army to be constantly evolving its approach—building local capacity and refining its niche in specific communities. How that niche takes shape in Phoenix, which was recently battered by a string of heat waves, might look very different from how it does in Hawaii, which is still dealing with the effects of the Puna lava flow and, as of press time, bracing for a hurricane. Yet, some of the recent disasters are helping lend guidance to several ways The Salvation Army can fine-tune its EDS work and maintain some “skin in the game” in communities across the territory. For one, its feeding operations are becoming more accommodating to more people. When you scan most restaurant menus nowadays, you tend to see a few more gluten-free and vegan options than you used to. Disaster relief should be no different. Being able to provide some culinary alternatives out of a canteen or in a shelter can show someone that you care, and that you’re adapting to meet their individual needs—not just those of the masses. Two, continuous training of upper leadership continues to prove critical. Staff turnover can cause losses in institutional memory, particularly when officers receive new appointments. That’s why it’s important to regularly conduct training from the top down, so that when a disaster strikes, everyone’s on the same page and there’s no ambiguity as to who’s responsible for what. As Ray suggested, it’s also not a bad idea for corps officers to be a part of their local Voluntary Organizations Active in Disaster (VOAD) coalition, so they’re well-acquainted with the other key players in town before the fire lets loose. Lastly, disaster relief is a full-time job even when there’s not an active disaster. When EDS responsibilities are tacked on to an already lengthy job description, sometimes it can inhibit a division’s ability to respond, rather than react. So designating more staff solely to disaster relief could pay dividends, as the “downtime” poses an excellent opportunity to get out in the community and build relationships with for-profit partners and local government officials—in hopes that when the disaster does arrive, everyone will be more prepared. The EDS response can no longer be reactive; we need full-time staff dedicated to providing effective and efficient help in times of disaster. 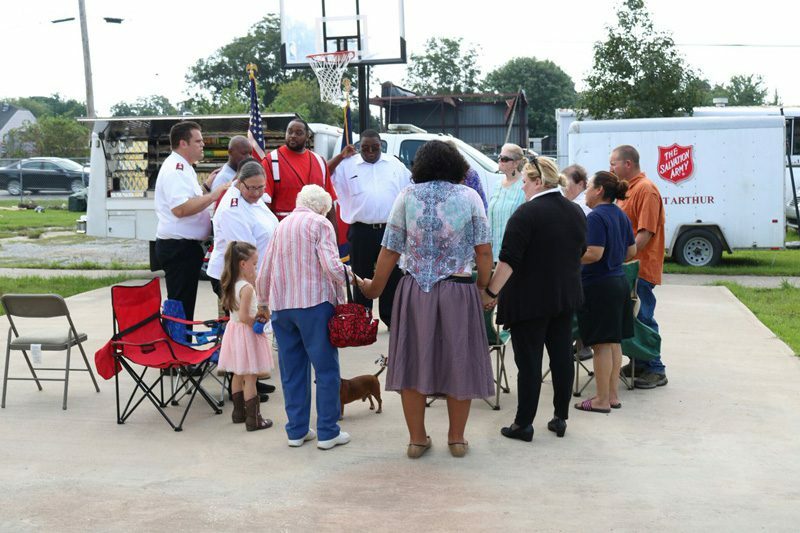 At the end of the day, every group out in the field has to know its role in a given disaster relief operation, and it has to do it extremely well to continue to be a part of the conversation. Because as paramount as it is to find good partners, it’s just as important to be one, too.